A fast, cold storm blew into San Diego County Wednesday. 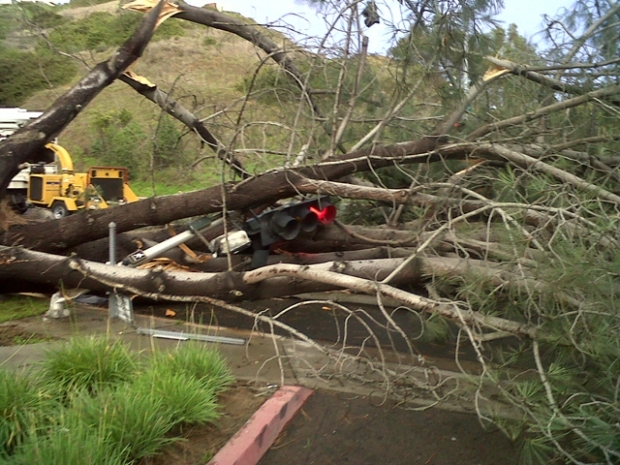 The North County saw the heaviest rain early Wednesday morning. The cold part of the storm was forecast to arrive later on Wednesday as most of the moisture passes to the east. The storm is fueled by subtropical moisture from north of Hawaii, combined with low pressure over the Northeast Pacific. The previous storms were fed by a similar plume, but originated from south of the Hawaiian Islands and rained most heavily in the southern half of the state. 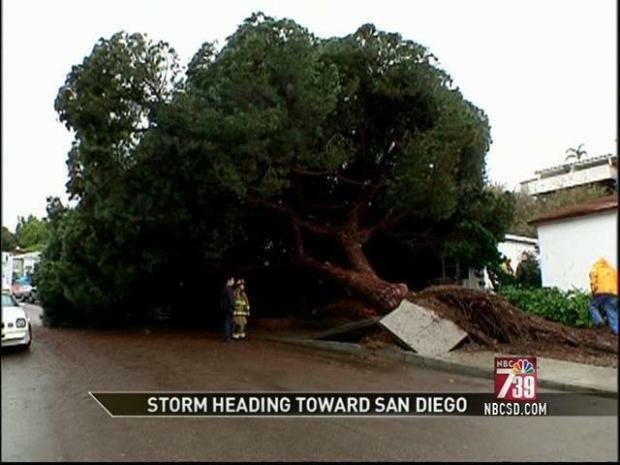 It has the potential to cause more flooding and mudslides. 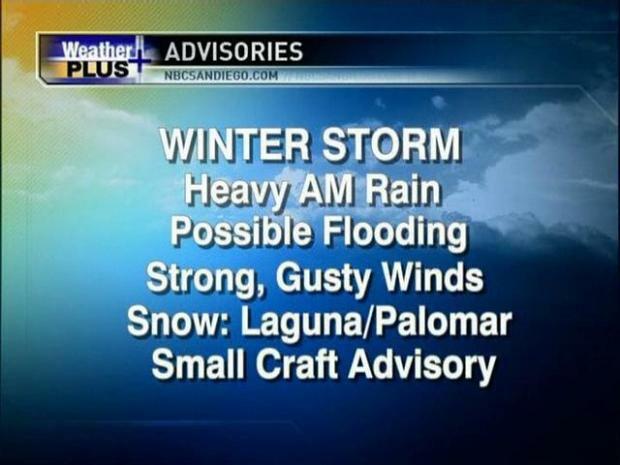 We're only expecting a little snow, maybe an inch or two at the tops of Laguna and Palomar. Once the cold air arrives, even a brief, isolated shower traveling over the mountains could produce some snow flurries as low as 3,000 feet, so places like Julian and even Pine Valley could see snow. But it probably won't be enough to accumulate. Whitney Southwick gives you the Morning Forecast for Wednesday, December 29, 2010. Winds could also be a problem in the mountains. Wednesday morning the county saw gusts over 30 mph and later in the day they could reach 50 mph or more. By Thursday morning the rain and snow will be over but the cold will still be with us. In the mountains highs will top out in the upper 20s Thursday and Friday with lows in the low 20s. In the East County, we could be looking at wide spread frost both Thursday and Friday morning as low temperatures drop into the low 30s. Highs for the next five days don't improve much. It will be mid 50s until the weekend, then low 60s with a chance of more rain late Sunday. While homeowners fight the floods, local farmers are looking at the rain as a financial blessing. High water prices have forced some farmers out of business, according to Eric Larson with the San Diego Farm Bureau. "Every drop means more money in the farmer's pocket," said Larson. Farmers around the county are able to turn off the sprinklers and let Mother Nature do the watering. Even some golf courses are welcoming the wet weather. While it means a loss of revenue from golfers, the rain can save a course thousands of dollars in "natural" watering.